Ahh, the colors, sights and sounds of autumn! 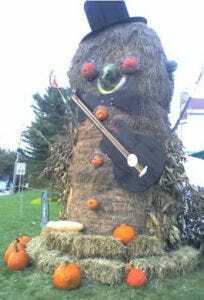 Fall is here, and with it comes one of our favorite festivals of the year: PunkinFiddle. A September tradition – so you can think of it as truly a fall event – the festival is highlighted by outstanding crafts and old fashion New England fun. There is something magical about a horse on a farm. Mount up and have your little one ride a pony or hop aboard the Wagon ride to tour Laudholm Farm the old fashioned way. Sitting atop a hay bale in the Maine fall air is a great way to spend the afternoon. One of the most picturesque parts of Laudholm Farm is the historic old barn. Inside, one can experience the old ways of hand crafted lore. From violins to folk instruments, looms to weaving, Mainers are still making amazing crafts with the best tools we know – our hands. Sure you can chill with the Alpacas, rabbits and goats back at the barn, but for those who like the action, it’s the sheep dogs. Watch and learn as real sheep dogs herd sheep on the farmhouse front lawn. Get along, little doggie! Fresh churned butter. Cider donuts. And the ever popular Maine whoopee pie. Add in some switchel tasting and pumpkin craving and you’ve got as tasty a meal as ever known. And if we seem to be speaking a strange Maine code here, you’ve got to get to Ogunquit more often. Songs tell a tale – and so does story time. Enjoy both at PunkinFiddle. With ho-down banjos, some jug playing and a possibly cowbell sighting, you’ll be knee slapping before the day is done. And if all that tuckers out the little ones, a good bed time story of how important nature and the farm is while help the young ones learn a little and enjoy a lot. Still not sure about PunkinFiddle? Add a little extra fall fun with a hike at Mt. Agamenticus or a drive to the top to see the foliage. Ogunquit from this view is absolutely charming. Be sure to bring your camera. There really is nothing as refreshing as the crisp air, making it perfect for enjoying the outdoors or walking by the sea. If you’re thinking of visiting our Ogunquit hotel in September, to enjoy a cozy cocktail by the pub fireplace or head to Maine for family fun, check out our PunkinFiddle package and great hotel room choices with a central location.